The issue you are having is possibly caused because Entourage downloads messages by using an ID number so if the server is reset by yahoo then the ID numbers are changed and Entourage thinks they are all new messages and will download everything in your Inbox, Unfortunately short of changing to a provider that supports IMAP (which Yahoo does not unless you have the premium account) there is not a lot that can be done. Thank you Eric. I do have a Yahoo Premium account. I am not too technically oriented, most of this is a mystery to me. But, I do know that I have a Premium account. Would that support IMAP? the issue you would have is that to use IMAP with Yahoo you wouldd have to create a new email account which of course means you would not be able to use your current adddress, Honestly the best thing to do by the sounds of what you have going on is to download a duplicate script for entourage and just run it when you get the dump of duplicates. In that case let me introduce you to one of the best things a mac will do that you probably never heard about. Just download the script then once donloaded unzip the contents and move the file to the ~/Documents/Microsoft User Data/Office X Identities/your identity folder. Just be careful as when you realize just how many free scripts there are to do just about anything you may become addicted to them like I am. Ok, I'm game. I will try this. One last (I promise) question. 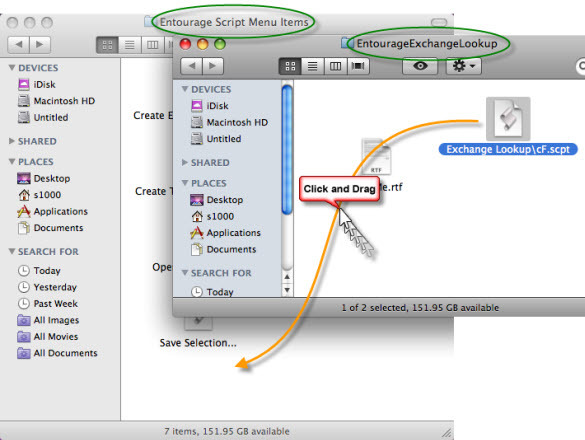 I don't see a "scripts menu" at the top of my Entourage page. Am I looking right at it? Let me do this with some screen shots so you can see what I am talking about. Eric, thank you so much for your patience. I am about to dive into the deep end of the pool! (at least for me). Thanks for your help. If you have any issues just let me know, Also if you take a look through the Entourage Help pages after you are done you will also see a lot of scripts which you may like. Remember most are 100% free and you can find a script to do about anything you want. Hello- I have had a disaster with my email browser- Entourage. iMac G4, full Earthlink inbox, Mozilla Thunderbird 2.something.